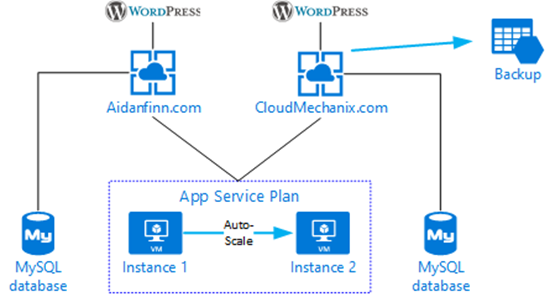 I’ve just migrated AidanFinn.com from a Windows Server 2012 R2 Azure virtual machine to an App Service (web app) running on the same App Service Plan as CloudMechanix.com. This site, AidanFinn.com has been running on an Azure VM for the last few years. That has given me a lot of experience with running a production workload in Azure. Azure worked well. What really irked me was MySQL, running in the VM by the way. MySQL blew up once, and wouldn’t restore, so I had to restore the entire VM. And MySQL continues to be a pain, causing the site to crash, requiring full VM reboots. 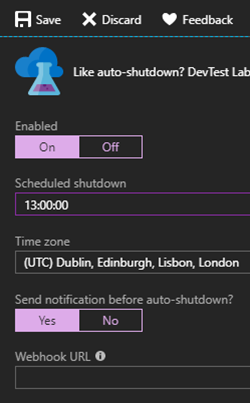 I was facing an eventual upgrade of the VM (a migration in Azure) so I made the decision to reduce my maintenance workload. I decided to switch to PaaS, and let Microsoft do the work. I previously blogged how I deployed the Cloud Mexchanix (my Azure training business) onto an Azure app service plan. I also created a stub WordPress site for AidanFinn.com, running on the same plan. The two WordPress site runs on different app services (application pools) on the same WS2016 machine, managed by Microsoft. I have auto-scaling enabled so a single (only in this case) load balanced VM instance can automatically be spun up if the CPU/memory load requires it. Both sites are using Azure Database for MySQL instances, where Microsoft looks after MySQL for me. In other words, the VM, the guest OS, and the database system are managed by Microsoft. I manage the web content. Perfect! The migration of AidanFinn.com has always been a challenge, from it’s origins as a “Joe Elway” blog on Live Spaces all the way through to it’s previous existence as an Azure VM. I remember the bad old days of exporting and editing multiple XML files to get a migration to work once. And this time was no different. The built-in WordPress Import refused to work. I tried another third-party plug-in and that wouldn’t work. Then I tried the All-In-One WP Migration plugin. It took hours to do a 1 GB export of the content and database from the VM. When I tried to do an import, I exceeded the 512 MB free limit, so I had to pay for the professional edition ($69 or so). The import also took ages, but the site was lifted and shifted exactly as it was. The it was time to add the custom domain names to the app service in the Azure Portal. A quick query with my DNS registrar (Blacknight) told me how to create @ records in their control panel, and I was done! I will look at hosting the domain in Azure, like I did with Cloud Mechanix, but all the Office 365 records will take time to create first. What about the old machine? It can take up to 24 hours for DNS changes to be replicated around the world, so it will remain running until tomorrow afternoon. I have configured Auto Shutdown in the settings of the VM, with a notification to be sent to me by email first. And that will be that! Both of my websites will be running on Azure App Services. The App Service size is S1, costing ~€61.57/month. Each database will cost under €30 per month. Some blob storage (€0.02 per GB) is being used to backup the sites – restores have been tested! While the total is well above a $10 web hosting plan, I cannot use such plans, because I was kicked off of that platform because AidanFinn.com generated too much load. So it’s either VM or PaaS, and PaaS suits me more because there is less for me to maintain now that I am there.